Need some motivation to kick your business idea into high-gear? 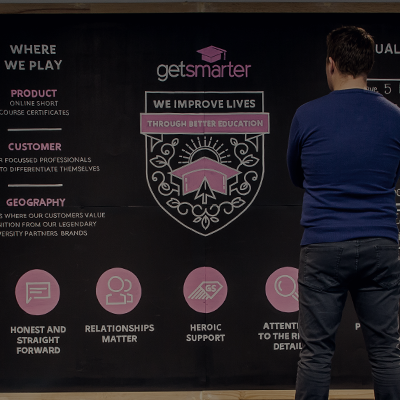 Rob and Sam Paddock, Co-Founders of the digital education company, GetSmarter, chatted to Matt Brown, Podcast Host, about their massive international acquisition, their struggles coming up with an idea that works, motivation, and more. How do you feel about the R1.4 billion acquisition of GetSmarter? It’s a big number. The key for us is that its representative money, an easy way to reference the world and the underlying success of the business. It’s a very proud moment for all of us and a kind of a strengthening of the base of GetSmarter as it relates to our future potential. 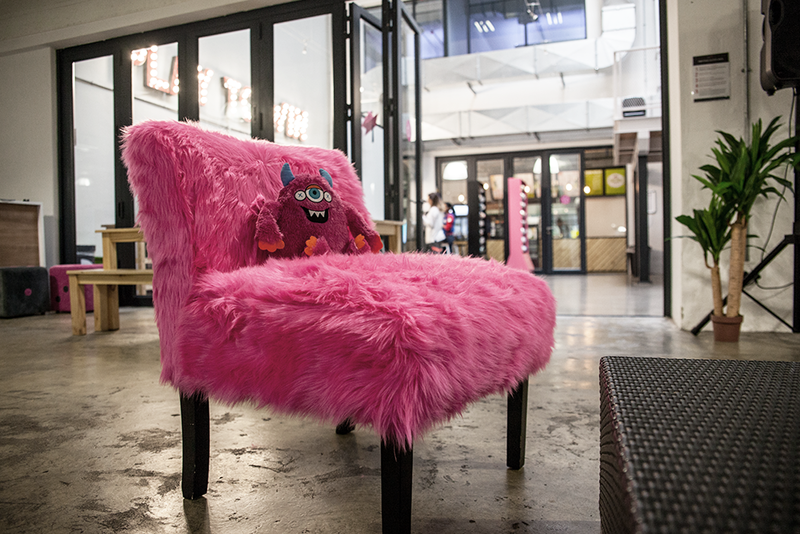 The point around the capability of South African entrepreneurs cannot be overstated. As South Africans, we are infinitely capable, and I think we don’t back ourselves enough. I think we need more stories like this, more success stories of South African companies winning on an international stage to kick our butts into gear, to realise we’ve got what it takes. A lot of what we lack is a mindset that we need to go after this. 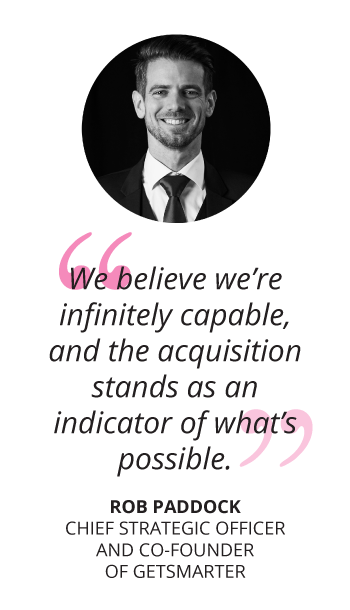 We believe we’re infinitely capable, and the acquisition stands as an indicator of what’s possible. What was the pain you were going through when you decided to start GetSmarter? Two brothers, together with their mother and their father, set out to do something important. We did our best and we worked our butts off to get the very first customer, and that led to a win right at the start of our business journey which gave us the confidence. There’s nothing quite like when your first project of four or five months comes off, which our first project was this Wine Evaluation course from Stellenbosch University, and you get that affirmation, that confirmation of what you’re doing – people will pay you for. I think that gave us the sense of self-belief to go and do it again, and we did it again, and again with other universities. And over time we built a meaningful business. Was this your first experience in business? Sam and I have slightly different stories there. I was fortunate enough to be part of a company that was based in Cape Town, South Africa that then set up shop in London. 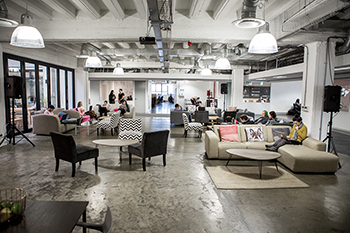 I was fortunate enough to be part of that – in the trenches, in a startup getting the business off the ground in London. That wasn’t my business but I was very much involved. I’ve been trying to start businesses all my life and failing every moment of the way. I tried to sell Ninja Turtle stickers in grade three. And then in university, I tried to start a web design company in London. And then when I got back to South Africa I tried to compete with private property with a company called No Agents, and again it didn’t work. And then I was Co-Founder of GetWine in 2005, and then post Rob, my parents, and myself starting GetSmarter, we failed a lot. We tried a lot of new things and subsequently started a professional education agency for corporates, in something called Hubble Studios. When the electricity crisis hit, we tried to create backup box generators for lights and TVs – disaster. And many things along the way which didn’t really work, to be clear. But I think it’s been a relentless pursuit of what sticks. What would you say to entrepreneurs, listening and watching right now, about failure, and how to deal with failure? South African culture specifically and our association and the way we perceive failure – it’s not cool. But I think, the point I’m trying to explore is that it’s okay to fail. All those failures you had, you were learning how not to make decisions. I think it’s reasonably easy in theory or in principle to talk about failure and to talk about why it’s so important and how you should expect it and so on. It’s another to actually live through failure, and since we’ve started, we’ve launched a number of initiatives that have failed radically. And it’s hard, and it hits you to your core. Coming back to the theoretical principles though, you can think about currency and the Rand or Dollar value of currency, you can also think about learning as a currency in itself. And I’ve found the subtle shift in mindset when thinking about learning as an actual currency that is something that builds over time in your life to soften the blow when the inevitable kind of ego hits happen. I have a mental model – building a learning bank account over time, which helps me to deal with how hard and how personally I take the challenges. The paradox of success that is built on failure. My wife’s just given birth to twins, and they constantly fail all the time, and they learn, and so they progress. I think a big question for me is do we have a healthy relationship with failure? Because it’s also not healthy to say I’m going to set out to fail, equally as it is unhealthy to try and desperately avoid failure – and so my sense is what’s kept up the object of a business is to survive like we always think of this thriving, no, it’s to survive. The entrepreneurial audience will resonate with this, it is about survival and whereas it relates to survival you have to be a little paranoid about your risks and failing. I don’t want to fail – that doesn’t mean you don’t give yourself permission to fail and to manage yourself through it. Let’s understand that as we fail in the ordinary course of the day, and hopefully not catastrophic failures, like those are the seeds of progress. I think it’s about a healthy relationship with failure, one that has circling back to the failures understanding and extracting it for all this learning value, and then progressing. What was the biggest crisis you’ve had, and what were the events leading up to it? We were working in an office across the road, Sam and I for a long time used to sit next to each other. However, we were not managing cash flow effectively. And we were in May, and we realised we weren’t going to be able to pay salaries in July, based on our current trajectory. And at that point, we probably had a hundred and twenty staff or so, and that was about one of the most panicked feelings I’ve ever had. You feel a sense of responsibility to your team members to keep this thing going, to pay their salaries. They’ve got responsibilities to meet themselves and the sense that we had not been paying enough attention and had gotten to the point where we might not even be able to pay salaries was probably one of the most heartbreaking moments of my life. Thankfully, we went immediately into action mode and ran a massive early bird promotion campaign where students paid upfront for a particular course and they would be able to get a discount. And we managed to manage our cash flow just well enough to make sure that we got through that period. I think speaking to what was an obvious failure we made sure that we never got into that position. 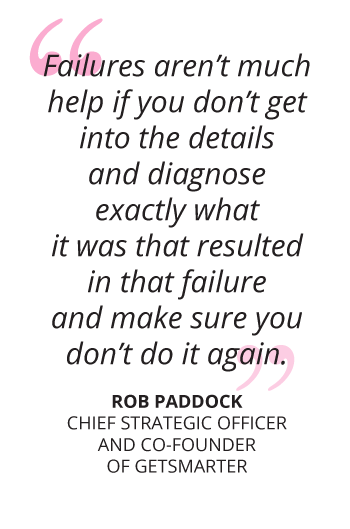 Failures aren’t much help if you don’t get into the details and diagnose exactly what it was that resulted in that failure and make sure you don’t do it again. What would you say to entrepreneurs who’ve lost the shirts off their back and are a bit ambivalent now about reaching out for the stars and pursuing their dreams? What would you say to that person, and how do you get them to stand up again? This is very practical advice as opposed to a philosophical view. You know, often, we’re at the point in your late twenties, early thirties, you’ve got real responsibilities and managing your own cash situation and having that stress taken off the table helps you to make better decisions about your business. If you’re making decisions based on meeting short-term objectives again and again and just getting money in the bank, you’re likely to be setting yourself up for an ultimate business failure. What I’ve seen work well is when people do part-time work which just sufficiently covers their expenses and start a business on the side. You don’t necessarily in the early stages need to dedicate yourself to it full time. Make sure your basic expenditure is taken care of by the reliable income stream that you have from regular work, and then start your business on the side. You’re going to work like hell in order to do that but there’s going to be sacrifice in order to actually start gaining sufficient traction with your business, to get it to the point where you can justify jumping in full-time. What do you two disagree on, as brothers, and how do you go about making sure you have the right partner? What comes with brotherhood is a deep understanding of one another, and based on our upbringing (we were fortunate enough to have great folks) – trust. The challenges that occur are mainly archetypical, like you’ve got competitive issues between brothers. I think we had more of the right benefits and less of the wrong kind of attractions over time. We saw a psychologist weekly, or bi-weekly, for some time when we were going through some harder times and just dedicating ourselves to aligning all the time. 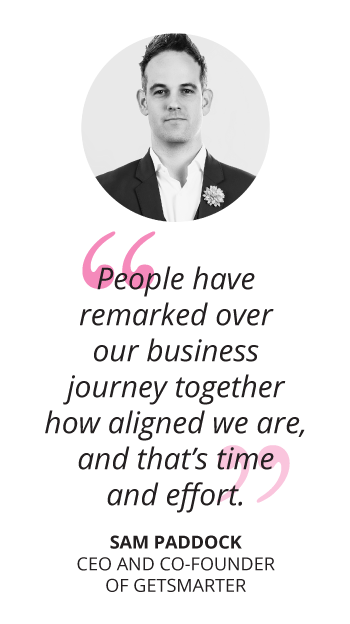 People have remarked over our business journey together how aligned we are, and that’s time and effort. It’s messy at times but you push through that and you get to the point. The situation as brothers is actually remarkably similar to just about every other relationship you have with any person who you significantly partner with – it’s the same work you need to put in. We work hard at it, and Sam speaks about that alignment, that alignment has come because of the hard work. The other thing that happens is that you spend enough time together and you start to train the way that you think and it gets easier. So what I would say to entrepreneurs out there who are in the midst of trying to find each other and trying to find alignment with their partners – keep at it and work diligently on yourself, as much as you work on the relationship between yourselves is what ultimately will lead to some degree of success and the good news is that if it is a good match between the two people it does get easier. I’ve found that in our relationship we had to work a lot harder at it in the early stages, and as alignment, trust and familiarity has grown, it’s gotten easier. Who is the first person that you hire? It’s probably one of the biggest challenges of self-funded startups – how do you scale your business given that it was just you to start? I think every situation is different, and depending on the needs of the business at any one time, the question is who’s going to do the work? If business is just people doing things, as you scale the things increase in size and now you need a range of people to do that work. The question is, do you know who you are and what you’re good at, and how can you as quickly as possible employ and delegate tasks and projects to people who can do their work better than you? And the biggest challenge of that is like how do you scale in a way which takes into account constraint of your cash flow, of what work needs to be done when and can you work more than 14-18 hours a day? Who you employ and when you employ them is in relation to who you are and what you’re good at, and what you’re not good at because you want to employ people in the areas you’re not good at in relation to your cash flow and when you can afford them. Then there’s the cultural piece which I think is probably the most important medium and longer-term consideration, which is will this person impact your culture, the way things get done at your business and the behaviours and values of your business? What happens in the early days is that the people who see the organisation’s culture have an outsized impact on everyone else’s culture because they bring with them ahead of time – the way things get done, and new people that come in adopt those same principles. 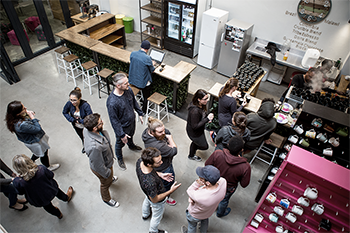 So who you get, who your partner is is, who your employees are – if you get it right, you have an outsized impact, if you get it wrong you need to cut. How do you go about finding your weaknesses? Well, I think there’s a couple of ways you might think about it, the one is the overarching development of a reflective practice on yourself and you might bring in people who are close to you. We had the benefit of each other from the outset, we’re able to be kind of bouncing boards for each other, hold up a mirror to each other on certain elements. So that was a distinct benefit that we had. But, you know those sorts of reflective processes can happen with mentors, they can happen with people that you bring into your life, close friends that sort of thing, who can help you give another perspective on what you’re doing well and where you might need to improve. I have a sense that additional perspective is helpful, but the internal perspective, the internal honesty that you’re able to develop about yourself, it kind of comes from a learner-mindset that says I constantly need to learn, I need to figure out what I’m good at, what I need to improve on. We refer to the term often at GetSmarter – The New Professional. The New Professional in the world of work that is looking to establish themselves in a constantly changing environment and to kind of constantly be pinpointing themselves relative to the work that needs to be done, and so do we at GetSmarter. We offer a range of short courses to help people upskill themselves in those areas where they are lacking. We offer a regular newsletter that people are able to subscribe to which gives them professional advice on how to deal with the new world of work. I think that by developing this learner-mindset and becoming a New Professional, seeing this job of work being that it is constantly about your learning and your reflective practice, seeing what you’re good at, seeing what you’re not good at, where you need outsource, where you need to upskill yourself. I think you stand in good stead to make those individual decisions where it’s hard to say generally what those might be. What is your experience in picking yourself up and carrying forward and pushing through that barrier you’re experiencing? 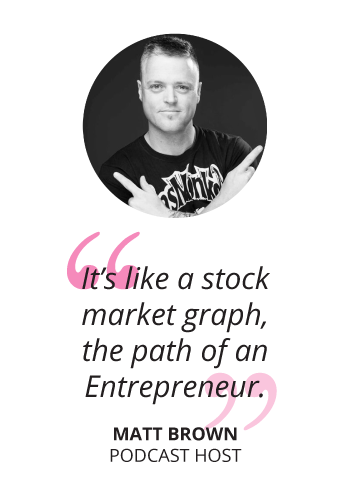 I think entrepreneurship is not a be all and end all, and if you look at the stats, a lot of what makes entrepreneurs successful or the new enterprise and startups moving into hockey-stick territory successful, is timing. Which are stuff that we don’t always control and its well covered in Gladwell’s Outliers and how he thinks about Jobs and Gates and the way they succeeded because they were born at the right time, like into their computer space. My point is that I think it’s much more about a very personal journey for the individual, what entrepreneurship has offered us – you get a full spectrum feeling of being alive by starting your own business and engaging with the great highs and the deep lows that accompany ultimate responsibility for something. Probably not too dissimilar to that of parenting, although I’m a new parent, and I feel like that’s something which I’m experiencing now as well – the deep highs and lows. The entrepreneurial mindset is about creating something without regard for resources currently controlled, that’s a scary space to be, with huge reward if you get it right. And without being labeled as an entrepreneur, you can engage in entrepreneurial-like behaviour. I think I would give a very practical point which is that managing your own energy and this is a particular queue for me right now because I haven’t been doing it recently, couldn’t be more important. If you’re fundamentally coming off a low base, and when I’m talking about a low base – it’s physically, energetically, mentally, you’ve been grafting for 14-18 hours every day, you’re not sleeping, you’re stressed out your eyeballs. It’s tough to just take a knock and be like I’m just going to motivate myself and get back on track. My question to entrepreneurs out there, and this is different for everyone, what are you doing to manage your energy, what are you doing to make sure your health is in good order, your closest relationships are in good order? Those form the foundation on which you build your entrepreneurial activity on top of. When you’re coming off a strong base you’re much better equipped to deal with the changes that inevitably come your way in entrepreneurship. Take control of your future and start working towards your business goals today.